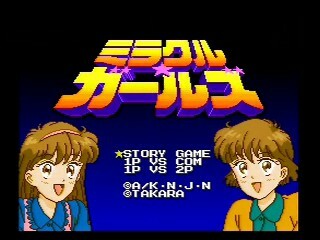 Miracle Girls (Takara Co, 1993) is a hyper-sugary platformer based on a manga. You take control over one of two twin girls with the ability to chuck sweets at jolly cartoon creatures that turn them into platforms. The creatures that is. Or the sweets that is. There's also rotating flowers that either hold your weight or let you through into a pit. Luckily your sister will telepath the right one each time. Best Time: 0:18:25 by Wesley 'Molotov' Corron on 2014-11-17. Authorblues: I saw his time on PB Tracker, which gave me new motivation to run the game. Also learned that Tomomi is faster from that run, though I didn't really take anything else from it. - Tomomi and Mikage play the same, but have a couple different boss mini-games. One of Mikage's temporarily stops the clock between rounds, and the other can become unwinnable from bad RNG. Tomomi is the clear winner because of these two things. - It's always best to throw candy in mid-air, since you'll stop moving forward otherwise. - Getting hit on the ground hardly wastes time. It gives you a crazy amount of invincibility frames, so it can be useful to go through mobs (stage 5). If you get hit on a moving platform, you're almost guaranteed to fall in a pit. - There are three jump heights: short, medium, and high. Medium is a pain, and is necessary near the end of stage 1. - There's only one type of candy throw. - There's only one movement speed. - Tomomi has a fantastic walking animation. - You can only have two candy pieces on the screen at a time. - The first four stages have alternate routes near the end. All of them are faster than the standard route, because they skip scenes where Tomomi and Mikage team up to do magic/save animals. - Holding Start auto-skips scenes after bosses. (Relevant because I can't mash.) Unfortunately though, the only button that advances dialog is A, and you need to hold it to speed it up. The flower petal jump just before the elevator to the alternate route is annoying. A short hop won't give you enough height, but a full jump will cause you to hit the enemy and die. I lost a fair number of attempts from screwing up the medium jump here. Boss mini-game: Don't move. You can't lose. Solid AI! Boss mini-game: I like how this mini-game is all about trolling. "You want that pink cloud? Nah, I think I'll just make it mad enough to shoot a lightning bolt on you instead." Also, the pre-battle duck sprite is by far the best in the game. Stage 3: The part near the end with the trampoline was messy, but everything else went fine. Like I said, that combination of enemies isn't fun at all. Needing to bribe the teacup to get on the trampoline is the normal method, so it wasn't really a mistake. Making the jump from the ledge on the left is just too precise for me most of the time. Boss mini-game: Whack-a-mole with input that ranges from total crap to overly sensitive. I like to stay near the middle, but the game sometimes sends me flying to a corner for no real reason. Luckily, the game is easy. Stage 4: That bunny early on was messing with my head. I usually short toss another candy piece when I hit the ground, but he was freaking me out or something. It might have been faster at that point to just walk into him, but oh well. The main concern with this stage (and the whole run, really) is making the leaps of faith near the middle. For the white Lego, you need to jump immediately after it stops moving to the right. Too early or slightly too late will cause you to either miss the jump entirely, or land near the middle of the red Lego (and then you're doomed). For the red Lego after that, you need to somewhat predict when it's going to stop moving to the right. About the time it starts moving down, you need to be in the air. Like the other jump, poor timing ends in death. Other than that, most of it straightforward. For the trampoline near the jumping dice, I time a candy toss just after Tomomi finishes passing the card platform. That gets the first guy, and apparently, a full jump toss gets the second guy. The cannon afterward is pretty much a forced hit, because while it's possible to avoid taking damage, it would be extremely difficult in such a small space. I don't think it's even worth it to try. By the way, the alternate route for this stage has a somewhat precise jump to the higher level. If you miss it, you'll land on Mikage and trigger the scene. Needless to say, wasting time setting up the detour and then triggering the scene anyway would be a total run killer. Boss mini-game: Hiding here is a good way to avoid all hits. He'll only fire at you if he sees you at a certain range, so you only need to move if he approaches from the top or bottom corners. Just to be entirely sure, I block as he passes (you can't hold the button). Stage 5: This stage went very well. All of the damage I took was intentional, though I took the last hit slightly earlier than usual. It's definitely possible to get through that second half with well-timed pauses and jumps, but it's both easier and (possibly) faster to just tank everything. It's worth noting that on the spinners, the blue guy at the end can hit you at that range. The second guy's attack has a shorter range, so you'll be safe on the edge. Because of that, I really wanted to bribe the blue guy before he got the chance to fire. If I had missed that, I would've need to panic jump to the leaf and hope I make it. Quite a few good attempts ended on this guy. Boss mini-game: Just a boss rush, so it's the same stuff as before. You get to troll the poor duck again though.